For the composer, see Louis Le Prince (composer). Louis Aimé Augustin Le Prince (French: [lwi lə pʁɛ̃s]; 28 August 1841 – vanished 16 September 1890) was a French artist and the inventor of an early motion picture camera, possibly being the first person to shoot a moving picture sequence using a single lens camera and a strip of (paper) film. Although some have credited him as the "Father of Cinematography", his work did not influence the commercial development of cinema—owing at least in part to the great secrecy surrounding it. A Frenchman who also worked in the United Kingdom and the United States, Le Prince's motion-picture experiments culminated in 1888 in the city of Leeds, England. In October of that year, he filmed moving-picture sequences of Roundhay Garden, Leeds Bridge and his brother playing the accordion, using his single-lens camera and Eastman's paper negative film. This work may have been slightly in advance of the inventions of contemporaneous moving-picture pioneers such as William Friese-Greene and Wordsworth Donisthorpe, and years in advance of that of Auguste and Louis Lumière, and William Kennedy Dickson (who did the moving image work for Thomas Edison). Le Prince was never able to perform a planned public demonstration in the US because he mysteriously vanished from a train on 16 September 1890. His body and luggage were never found, but, over a century later, a police archive was found to contain a photograph of a drowned man who could have been him. The reason for his disappearance varies. The theories include a murder set up by Edison, suicide, secret homosexuality, intentional disappearing in order to start a new life, and a murder by his brother over their mother's will. At the start of 1890, the Edison workers had begun experimenting with using a strip of celluloid film to capture moving images. The first public results of these experiments were shown in May 1891. But Le Prince's widow and son, Adolphe, were keen to advance Louis' cause as the inventor of cinematography. In 1898 Adolphe appeared as a witness for the defence in a court case brought by Edison against the American Mutoscope Company. This suit claimed that Edison was the first and sole inventor of cinematography, and thus entitled to royalties for the use of the process. Adolphe Le Prince was not allowed to present his father's two cameras as evidence (and so establish Le Prince's prior claim as inventor) and eventually the court ruled in favour of Edison. However, a year later that ruling was overturned. On 10 January 1888 Le Prince was granted an American patent on a 16-lens device that could serve as both motion picture camera (which he termed "the receiver") and a projector (which he called " the deliverer"). That same day he took out a near-identical provisional patent for the same devices in Great Britain, proposing "a system of preferably 3, 4, 8, 9, 16 or more lenses". Shortly before it was due to be granted, he submitted an addendum which described in one sentence a single-lens system, but this was neither fully explained nor illustrated, unlike the several pages of description of the multi-lens system. This addendum was submitted on October 10, 1888 and, on October 14, Le Prince used his single-lens camera to film Roundhay Garden Scene. During the period 1889-1890 he worked with the mechanic James Longley on various "deliverers" (projectors) with one, three and sixteen lenses. It appears the three-lens version was the most successful. Those close to him have testified to him exhibiting his first films in his workshop and possibly elsewhere privately, but they were never presented to anyone outside his immediate circle of family and associates. In 1889 he took French-American dual citizenship in order to establish himself with his family in New York City and to follow up his research. However, he was never able to perform his planned public exhibition at Morris–Jumel Mansion in Manhattan, in September 1890, due to his mysterious disappearance. Consequently, Le Prince's contribution to the birth of the cinema has often been overlooked. On 28 August 1841, Le Prince's father was a major of artillery in the French Army and an officer of the Légion d'honneur. He grew up spending time in the studio of his father's friend, the photography pioneer Louis Jacques Mandé Daguerre, from whom the young Le Prince received lessons relating to photography and chemistry and for whom he was the subject of a Daguerrotype, an early type of photograph. His education went on to include the study of painting in Paris and post-graduate chemistry at Leipzig University, which provided him with the academic knowledge he was to utilise in the future. He moved to Leeds, West Yorkshire, UK in 1866, after being invited to join John Whitley, a friend from college, in Whitley Partners of Hunslet, a firm of brass founders making valves and components. In 1869 he married Elizabeth Whitley, John's sister and a talented artist. The couple started a school of applied art, the Leeds Technical School of Art, in 1871, and became well renowned for their work in fixing colour photography on to metal and pottery, leading to them being commissioned for portraits of Queen Victoria and the long-serving Prime Minister William Gladstone produced in this way; these were included alongside other mementos of the time in a time capsule—manufactured by Whitley Partners of Hunslet—which was placed in the foundations of Cleopatra's Needle on the embankment of the River Thames. In 1881 Le Prince went to the United States as an agent for Whitley Partners, staying in the country along with his family once his contract had ended. He became the manager for a small group of French artists who produced large panoramas, usually of famous battles, that were exhibited in New York City, Washington, D.C. and Chicago. During this time he began experiments relating to the production of 'moving' photographs, designing a camera that utilised sixteen lenses, which was the first invention he patented. Although the camera was capable of 'capturing' motion, it wasn't a complete success because each lens photographed the subject from a slightly different viewpoint and thus the image would have jumped about, if he had been able to project it (which is unknown). After his return to Leeds with his family in May 1887, Le Prince built and then patented a single-lens camera in mid-late 1888. An experimental model was developed in a workshop at 160 Woodhouse Lane, Leeds. An updated version of this model was used to shoot his motion-picture films. It was first used on 14 October 1888 to shoot what would become known as Roundhay Garden Scene, the world's first motion picture. Le Prince later used it to shoot trams and the horse-drawn and pedestrian traffic crossing Leeds Bridge. The film was shot from Hicks the Ironmongers, now the British Waterways building, a building on the south east side of the bridge, now marked with a commemorative Blue plaque. Working with the skilled mechanic James Longley, he attempted to create a projector during 1889 and 1890. The images were to be separated, printed and mounted individually on a flexible band, moved by perforations. It seems they did attempt to create a single lens projector, but ultimately settled for a three-lens device. His family and co-workers say they saw these images projected on a screen in the Leeds workshop, but no public projection ever took place. In September 1890, Le Prince was preparing to go back to the UK, to be followed by a trip to the U.S. to have the public première of his work. Before his journey, he decided to return home to France to visit friends and family. Having done so, he left Bourges on September 13th to visit his brother in Dijon. He would then take the September 16th train to Paris, but when the train arrived, Le Prince's friends discovered that Le Prince was not on board. He was never seen again by his family or friends. No luggage or corpse was found in the Dijon-Paris express, nor along the railway. The only person to see Le Prince at the Dijon station was his brother. No one saw Le Prince in the Dijon–Paris express after he was seen boarding it, nor did anyone notice any strange behaviour or aggression. The French police, Scotland Yard and the family undertook exhaustive searches, but never found his body or luggage. The grandson of Le Prince's brother told film historian Georges Potonniée that Le Prince wanted to commit suicide because he was on the verge of bankruptcy. He had already arranged his suicide and he managed for his own body and belongings never to be found. However, Potonniée noted that Le Prince's business was profitable and that he was proud of his inventions, and thus had no reason to commit suicide. Patent Wars assassination, "Equity 6928"
Christopher Rawlence pursues the assassination theory, along with other theories, and discusses the Le Prince family's suspicions of Edison over patents (the Equity 6928) in his 1990 book and documentary The Missing Reel. At the time that he vanished, Le Prince was about to patent his 1889 projector in the UK and then leave Europe for his scheduled New York official exhibition. His widow assumed foul play though no concrete evidence has ever emerged and Rawlence prefers the suicide theory. In 1898, Le Prince's elder son Adolphe, who had assisted his father in many of his experiments, was called as a witness for the American Mutoscope Company in their litigation with Edison [Equity 6928]. 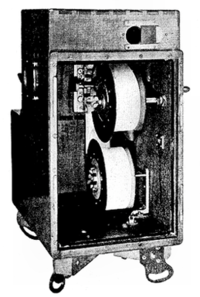 By citing Le Prince's achievements, Mutoscope hoped to annul Edison's subsequent claims to have invented the moving-picture camera. Le Prince's widow Lizzie and Adolphe hoped that this would gain recognition for Le Prince's achievement, but when the case went against Mutoscope their hopes were dashed. Two years later Adolphe Le Prince was found dead while out duck shooting on Fire Island near New York. In 1966, Jacques Deslandes proposed a theory in Histoire comparée du cinéma (The Comparative History of Cinema), claiming that Le Prince voluntarily disappeared due to financial reasons (already shown to be false) and "familial conveniences". Journalist Léo Sauvage quotes a note shown to him by Pierre Gras, director of the Dijon municipal library, in 1977, that claimed Le Prince died in Chicago in 1898, having moved there at the family's request because he was homosexual; but he rejects that assertion. There is no evidence to suggest that Le Prince was gay. In 1967, Jean Mitry proposed, in Histoire du cinéma, that Le Prince was killed. Mitry notes that if Le Prince truly wanted to disappear, he could have done so at any time prior to that. Thus, most likely he never even boarded the train in Dijon. He also questions that if the brother, who was confirmed to be the last person to see Le Prince alive, knew Le Prince was suicidal, why didn't he try to stop him, and why didn't he report this to the police before it was too late? Le Prince was officially declared dead in 1897. A photograph of a drowning victim from 1890 resembling Le Prince was discovered in 2003 during research in the Paris police archives. Even though Le Prince's achievement is remarkable, with only William Friese-Greene and Wordsworth Donisthorpe achieving anything comparable in the period 1888-1890, his work was long forgotten, as he disappeared on the eve of the first public demonstration of the result of years of toil—having never shown his invention to any photographic society, scientific institution or the general public. For the April 1894 commercial exploitation of his personal kinetoscope parlor, Thomas Edison is credited in the US as the inventor of cinema, while in France, the Lumière Brothers are hailed as inventors of the Cinématographe device and for the first commercial exhibition of motion-picture films, in Paris in 1895. Like Le Prince, another untold proto-cinema figure is the French inventor, Léon Bouly, who created the first "Cinématographe" device and patented it in 1892 (Patent N°219,350). He was never credited, as two years later his patent, which he had left unpaid, was bought by the Lumière Brothers (Patent N°245,032). However, in Leeds, Le Prince is celebrated as a local hero. On 12 December 1930, the Lord Mayor of Leeds unveiled a bronze memorial tablet at 160 Woodhouse Lane, Le Prince's former workshop. In 2003, the University's Centre for Cinema, Photography and Television was named in his honour. Le Prince's workshop in Woodhouse Lane was until recently the site of the BBC in Leeds, and is now part of the Leeds Beckett University Broadcasting Place complex, where a blue plaque commemorates his work. (coordinates: 53°48′20.58″N 1°32′56.74″W﻿ / ﻿53.8057167°N 1.5490944°W﻿ / 53.8057167; -1.5490944). His moving pictures are shown in the cinema of the Armley Mills Industrial Museum, Leeds. In France, an appreciation society was created as L'Association des Amis de Le Prince (Association of Le Prince's Friends), which still exists in Lyon. In 1990, Christopher Rawlence wrote The Missing Reel, The Untold Story of the Lost inventor of Moving Pictures and produced the TV programme The Missing Reel (1989) for Channel Four, a dramatised feature on the life of Le Prince. In 1992, the Japanese filmmaker Mamoru Oshii (Ghost in the Shell) directed Talking Head, an avant-garde feature film paying tribute to the cinematography history's tragic ending figures such as George Eastman, Georges Méliès and Louis Le Prince who is credited as "the true inventor of eiga", Japanese for "motion picture film". In 2013, a feature documentary, The First Film was produced, with new research material and documentation on the life of Le Prince and his patents. Produced and directed by Leeds-born David Nicholas Wilkinson, it was filmed in England, France and the United States by Guerilla Films. The First Film features several film historians to tell the story, including Michael Harvey, Stephen Herbert, Mark Rance, Daniel Martin, Jacques Pfend, Adrian Wootton, Tony North, Mick McCann, Tony Earnshaw, Carol S Ward, Liz Rymer, and twice Oscar-nominated cinematographer Tony Pierce-Roberts. Le Prince's great, great granddaughter Laurie Snyder also makes an appearance. It had its world première in June 2015 at the Edinburgh Film Festival and opened in UK cinemas on the 3rd July 2015. The film also played in festivals in the US, Canada, Russia, Ireland and Belgium. On 8 September 2016 it played at the Morris-Jumel Mansion in New York, where 126 years earlier Le Prince would have screened his films had he not disappeared. 16-lens camera and projector Patent: "Method of and apparatus for producing animated pictures. of natural scenery and life" (USA) and in all later foreign patents. Designation: LePrince 16-lens camera, designated by him as "receiver"
Other information: The existence of this camera is speculative. No description exists, but it seems likely that an experimental version preceded the one Le Prince successfully filmed with in October 1888. Back view of Le Prince's single-lens Cine Camera-Projector MkII opened (Science Museum, London, 1930). Le Prince developed a single-lens camera in his workshop at 160 Woodhouse Lane, Leeds. An improved version was used to shoot his motion-picture films. Remaining surviving production consists of a scene in the garden at Oakwood Grange (his wife's family home, in Roundhay), another at Leeds Bridge and of his brother playing the accordion. Half a century later, Le Prince's daughter, Marie, gave the remaining apparatus to the National Science Museum, London (it's now in the National Museum of Photography, Film and Television (NMPFT), Bradford, which opened in 1983 and in 2006 was renamed the National Media Museum). In May 1931, photographic plates were produced by workers of the Science Museum from paper print copies provided by Marie Le Prince. In 1999, the copies were restored, remastered and re-animated to produce a digital version which was uploaded on to the NMPFT website as public resources (Roundhay at the Wayback Machine (archived March 16, 2007) and Leeds). Roundhay Garden was said by the Le Prince family to have been shot at 12 frame/s and Leeds Bridge at 20 frame/s, although this is not borne out by the NMPFT versions (see below) or motion analysis. Since the NMPFT release, various names are used to designate the films, such as Leeds Bridge or Roundhay Garden Scene. Actually, all current online versions (e.g., GIF, FLV, SWF, OGG, WMV, etc.) are derived from the NMPFT files. However, Leeds Bridge is believed to be the original title, as the traffic sequence was referred to as such by Frederick Mason, one of Le Prince's mechanics. Sequence of 12 complete frames + 4 partial frames, from National Science Museum, London circa 1931. (Courtesy NMPFT, Bradford) NMPFT. Filmed in Paris before 18.08.1887. The only existing images from Le Prince's 16-lens camera are a sequence of 16 frames of a man walking around a corner. This appears to have been shot onto a single glass plate (which has since broken), rather than the twin strips of Eastman paper film envisaged in his patent. Jacques Pfend, a French cinema-historian and Le Prince specialist, confirms that these images were shot in Paris, at the corner of Rue Bochart-de-Saron (where Le Prince was living) and Avenue Trudaine. Le Prince sent 8 images of his mechanic running (which may be from this sequence) to his wife in New York City in a letter dated 18 August 1887, which suggests it represented a significant camera test. Exposure is very irregular from lens to lens with a couple of the images almost completely bleached out, so there was clearly much work still to be done. Roundhay, 1888 original 20 frames by National Science Museum, London 1931 (Courtesy of NMPFT, Bradford). Animation of Roundhay frames with image stabilised NMPFT, Bradford 1999. The 1931 National Science Museum copy of what remains of a sequence shot in Roundhay Garden features 20 frames. 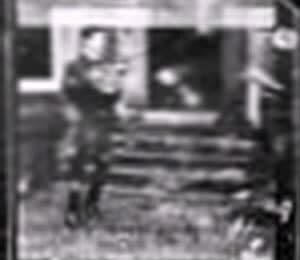 The frames appear to have been printed in reverse from the negative, but this is corrected in the video. The film's damaged edge results in distortion and deformation on the right side of the stabilised digital movie. The scene was shot in Le Prince's father-in-law's garden at Oakwood Grange, Roundhay on October 14, 1888. The NMPFT animation lasts two seconds at 24fps (frames per second), meaning the original footage is playing at 10fps. In this version, the action is speeded up, the original footage was probably shot at 7fps. 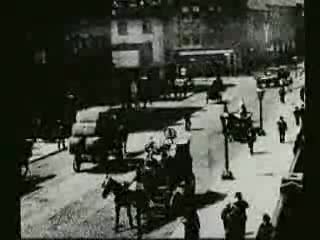 Louis Le Prince filmed traffic crossing Leeds Bridge from Hicks the Ironmongers at these coordinates: 53°47′37.70″N 1°32′29.18″W﻿ / ﻿53.7938056°N 1.5414389°W﻿ / 53.7938056; -1.5414389. The earliest copy belongs to the 1923 NMPFT inventory (frames 118–120 and 122–124), though this longer sequence comes from the 1931 inventory (frames 110–129). According to Adolphe Le Prince who assisted his father when this film was shot in late October 1888, it was taken at 20fps. However, the digitally stabilised sequence produced by the NMPFT lasts two seconds, meaning the footage is playing here at 10fps. As with the Roundhay Garden sequence, its appearance is speeded up, suggesting the original footage was probably shot at 7fps. This would fit with what we know of the projection experiments, where James Longley reported a top speed of 7fps. Copy of original 19 frames (numbered 41–59) by National Science Museum, London 1931 (Courtesy of NMPFT, Bradford). The last remaining film of Le Prince's single-lens camera is a sequence of frames of Adolphe Le Prince playing a diatonic button accordion. It was recorded on the steps of the house of Joseph Whitley, Louis's father-in-law. The recording date may be the same as Roundhay Garden as the camera is in a similar position and Adolphe is dressed the same. The NMPFT has not remastered this film. An amateur animation of the first 17 frames is here on YouTube. ^ a b c Howells, Richard (Summer 2006). "Louis Le Prince: the body of evidence". Screen. Oxford, UK: Oxford Journals. 47 (2): 179–200. doi:10.1093/screen/hjl015. Retrieved 2009-04-16. ^ THE "FATHER" OF KINEMATOGRAPHY: LEEDS MEMORIAL PIONEER WORK IN ENGLAND Our Special Correspondent. The Manchester Guardian (1901–1959), Manchester, England 13 Dec 1930: 19. ^ "Louis Le Prince, who shot the world's first film in Leeds". BBC. 24 August 2016. ^ a b "Pioneers of Early Cinema: 1, AIMÉ AUGUSTIN LE PRINCE (1841–1890?)" (PDF). www.nationalmediamuseum.org.uk. p. 2. Retrieved 2012-11-25. he developed a single-lens camera which he used to make moving picture sequences at the Whitley family home in Roundhay and of Leeds Bridge in October 1888. ... it has been claimed that a photograph of a drowned man in the Paris police archives is that of Le Prince. ^ Spehr, Paul (2008). The Man Who Made Movies: W.K.L. Dickson. United Kingdom: John Libbey Publishing Ltd.
^ "Pioneers of Early Cinema: Louis Aimé Augustin Le Prince (1841–1890?)" (PDF). National Media Museum. June 2011. Retrieved 2014-08-02. ^ "Method of and apparatus for producing animated pictures of natural scenery and life". 10 January 1888. Retrieved 29 December 2017. ^ "Patents Completed". British Journal of Photography. 35: 793. ^ a b c Aulas & Pfend, Jean-Jacques & Jacques (1 December 2000). "Louis Aimé Augustin Leprince, inventeur et artiste, précurseur du cinéma". 1895. Revue de l'association française de recherche sur l'histoire du cinéma. 32. ^ a b c d e f Herbert, Stephen. "Louis Aimé Augustin Le Prince". Who's Who of Victorian Cinema. Retrieved 2006-08-26. ^ a b Irénée Dembowski (1995). "La naissance du cinéma : cent sept ans et un crime..." Alliage, numéro 22, 1995 (in French). Archived from the original on 1999-11-28. Retrieved 2008-10-14. ^ Dembowski (1995): "1928, Georges Potonniée avance une autre hypothèse ... – Augustin Le Prince s'est suicidé. Il était au seuil de la faillite." ^ Burns, Paul. "The History of the Discovery of Cinematography". – "After his disappearance, the Le Prince family led by his wife and son went to court against Edison in what became known as Equity 6928. The famous Patent Wars ensued and by 1908 Thomas Edison was regarded as sole inventor of motion pictures, in the US at least. However, in 1902, two years after Le Prince’s son Adolphe had testified in the suit, he was found shot dead on Fire Island, New York." ^ Léo Sauvage, "Un épisode mystérieux de l'histoire du cinéma : La disparition de Le Prince", Historia, n° 430 bis, sept. 1982, p. 45-51: "une telle affirmation (...) est totalement dépourvue de vraisemblance". ^ Dembowski (1995): "Pierre Gras, conservateur en chef de la Bibliothèque publique de Dijon, en 1977, montra à Léo Sauvage une note (il la cite dans son ouvrage), prise lors de la visite d'un historien connu (il a tu son nom) qui avait déclaré : – Le Prince est mort à Chicago en 1898, disparition volontaire exigée par la famille. Homosexualité. Disons clairement qu'il n'y a pas l'ombre d'une preuve à l'appui d'une telle assertion." ^ Dembowski (1995): "S'il en était ainsi, pourquoi n'a-t-il rien fait pour l'empêcher de réaliser son funeste projet, pourquoi n'a-t-il pas averti la police à temps?" ^ Hannavy, John, ed. (2008). Encyclopedia of nineteenth-century photography. 1. CRC Press. p. 837. ISBN 978-0-415-97235-2. ^ "The First Film". Guerilla Group. Retrieved 2018-06-16. ^ "Cinematography". National Museum of Photography, Film and Television. Archived from the original on 2006-07-11. Retrieved 2009-04-16. ^ Letter from James Longley to Louis le Prince 8 August 1889. "The best result that I got was 426 per minute" - From Le Prince Collection in Leeds University Library. The Indispensable Murder Book, edited by Joseph Henry Jackson (New York: The Book Society, 1951), pp. 437–464, "The Red and White Girdle" by Christopher Morley. This deals with the murder of Gouffe, and shows the intense study of that trunk murder in 1889–90. The facts concerning the life and death of LOUIS AIME AUGUSTIN LEPRINCE, pioneer of the moving pîcture and his family, by Jacques Pfend (Sarreguemines/57200/France) 2014.ISBN 9782954244198. 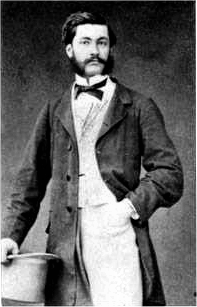 Wikimedia Commons has media related to Louis Le Prince. L'EMPREINTE DE LOUIS AIME AUGUSTIN LEPRINCE DANS L'HISTOIRE DU CINEMA. (Université Paris Ouest, par Marie Crémaschi. sep. 2013. Leodis – a photographic archive of Leeds. Leeds Library & Information Service. Allows search for key terms such as Louis Le Prince or Leeds Bridge or Bridge End or Hick Brothers or Auto Express (workshop site), etc.